With the earnings picture for 2009 and 2010 changing by the day, it's useful to take a look at Price-to-Sales as a measure of valuation. It doesn't have nearly the same volatility that Price-to-Earnings does. 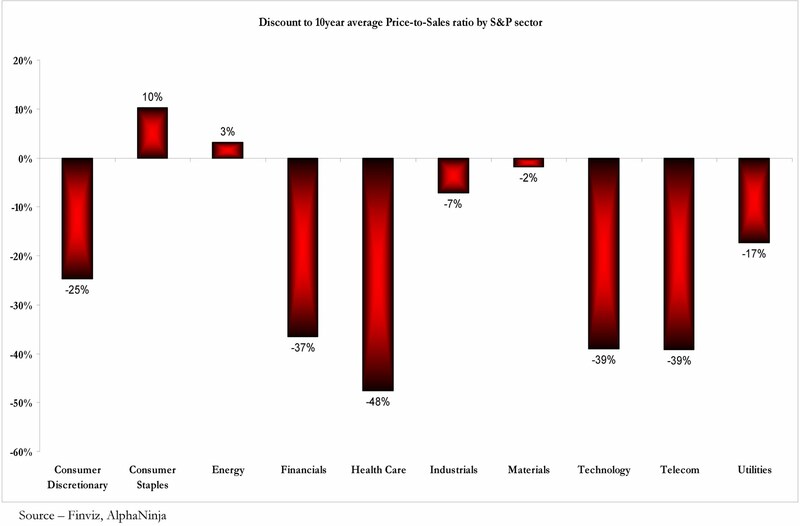 The below chart shows each sector's discount (or premium) to 10year average Price-to-Sales ratios. Not surprisingly, Consumer Staples stocks ("necessity" products) trade at a premium, as a safe-haven during economic upheaval. Tech shares trade at a 40% discount, despite having the highest expectations for five year earnings growth.